ANKARA, Turkey (AP) — Turkey has renamed the street that serves the Russian Embassy after the ambassador who was killed in an attack in the Turkish capital. Ankara Mayor Melih Gokcek on Tuesday presented a framed copy of his municipality's decision to rename the street to the widow of Andrei Karlov. Municipality workers then replaced the street sign with one inscribed with Karlov's name. ATHENS, Greece (AP) — Greek police say the head of the consular section at the Russian Embassy in Athens has been found dead in his apartment, but there are no immediate indications of foul play. A consular employee found the body of 54-year-old Consul Andrey Malanin at his apartment in the Greek capital on Monday. Police say a coroner will examine the body, while the police homicide department also is investigating the death due to Malanin's diplomatic status. WASHINGTON (AP) — Donald Trump hammered rival Hillary Clinton during the presidential campaign for failing to prevent the attack on the U.S. mission in Benghazi, Libya, when she was secretary of state. Soon he'll be the one responsible for protecting America's diplomats, but he's offered little insight into how he'll do that. MOSCOW (AP) — A U.S.-based Muslim cleric on Thursday condemned the killing of Russia's envoy to Turkey and rejected accusations that his movement was behind the attack. Ambassador Andrei Karlov was shot dead by an off-duty policeman in front of stunned onlookers at a photo exhibition Monday in the Turkish capital, Ankara. Turkish President Recep Tayyip Erdogan has implicated Fethullah Gulen in the killing, accusing his movement of links to the gunman. The assassination of Russia's ambassador to Turkey fits into a long tradition of political violence in a country where the fallout from the Syrian war is deepening the chaos. Turkey's toxic combination of problems includes a Kurdish insurgency at home and state purges following a failed coup attempt in July, meaning the security situation will remain extremely tenuous for a while. ANKARA, Turkey (AP) — Turkey's president on Wednesday implicated a U.S.-based Muslim cleric in the killing of Russia's envoy to Turkey, saying the policeman who carried out the attack was a member of his "terror organization." Ambassador Andrei Karlov was killed Monday evening by a gunman in front of stunned onlookers at a photo exhibition in Ankara. The assassin, Mevlut Mert Altintas of Ankara's riot police squad, was killed in a police operation. — Jan. 12, Istanbul: Suicide bomber kills 12 German tourists in historic district. Authorities say attacker was linked the Islamic State group. ANKARA, Turkey (AP) — Investigators from Turkey and Russia hunted for clues Tuesday in the assassination of Russia's ambassador to Turkey in front of stunned onlookers at a photo exhibition in Ankara. 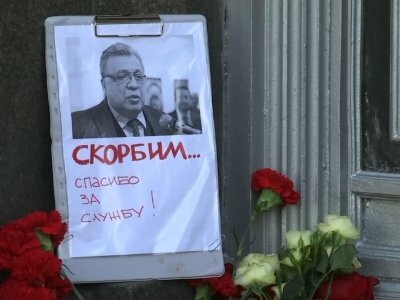 A team of 18 Russian investigators and foreign ministry officials arrived in Turkey and began inspecting the art gallery where the shooting of Andrei Karlov took place. ANKARA, Turkey (AP) — A Turkish policeman fatally shot Russia's ambassador to Turkey on Monday in front of a shocked gathering at a photo exhibit and then, pacing near the body of his victim, appeared to condemn Russia's military role in Syria, shouting: "Don't forget Aleppo! Don't forget Syria!" PALM BEACH, Fla. (AP) — On the day that his election victory became official, Donald Trump on Monday experienced what life will be like as president as he condemned separate deadly incidents against a Russian diplomat and shoppers at a German Christmas market, blaming Islamic terrorism in both instances. He offered no support for his claim that terrorists were responsible for the carnage.